These rum balls are mostly the exact recipe my Great Grandmother gave to my father. It differs slightly in that I use half milk chocolate chips, I added heavy cream to her recipe and I use a 12 year aged rum. Otherwise this recipe is the exact way my Great Grandmother use to make them for Holiday parties! I really hope you enjoy this family Holiday Party treat! Spread powdered sugar around in a small bowl. 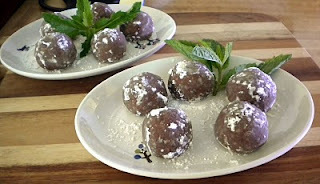 Roll balls one at a time in hands until smooth and then roll each one in the powdered sugar coated. Place balls as you finish them onto a nonstick cookie sheet. Once all of the balls are finished cover them with plastic wrap and freeze or chill in fridge until hardened (30-45 minutes.) Once hardened enjoy!